This shop has been compensated by Collective Bias, Inc. and its advertiser. All opinions are mine alone. #GameDayGlory #CollectiveBias I have always been fascinated with snack stadiums so when I got the opportunity to make on for game day, I was beyond excited! Not only do I get to make this awesome centerpiece but I will share with you how I did it. I headed to Walmart to collect all my necessary supplies; I needed building material and snacks to fill the stadium. 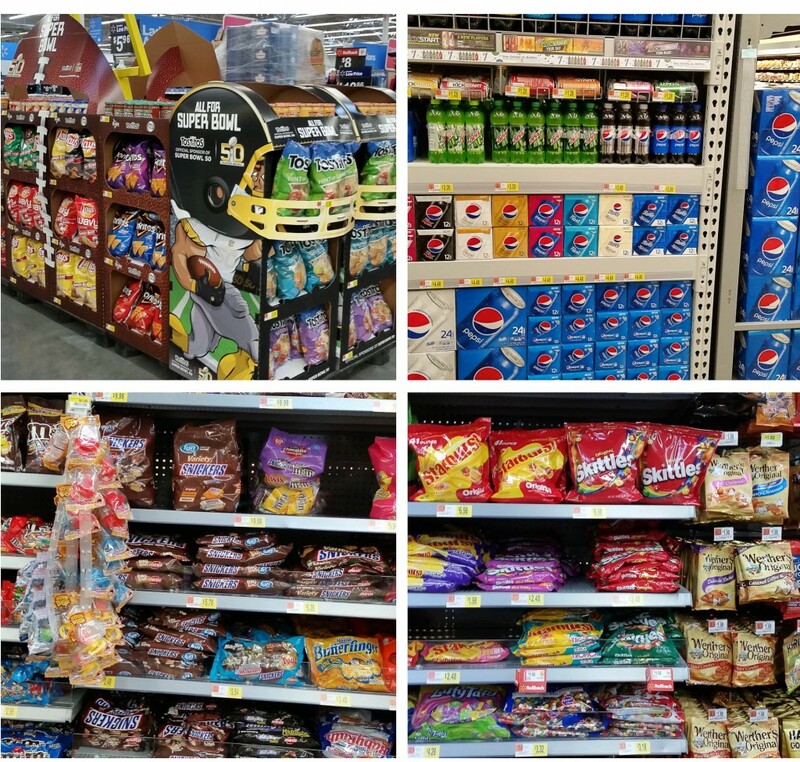 I grabbed a couple bags of TOSTITOS® Original Party Size, SNICKERS® FUN SIZE® variety, Pepsi™ and Skittles® as well as a sandwiches, wings, vegetables. I planned on serving these with a few dips so I grabbed a jar of TOSTITOS® Chunky Medium Salsa and I also picked up a couple packs of Pepsi™. Now on to how I built my snack stadium! You won’t believe how easy it is. To start, cut all four corners of the foam board to make them round. I simply used a kitchen plate as a guide and cut along the edges. Next center the aluminum foil pan on the foam board. I used the yard stick to measure each side to make sure it was even on opposite sides. Next grab the poster board and cut strips that are equal in length and height to the foil pan. 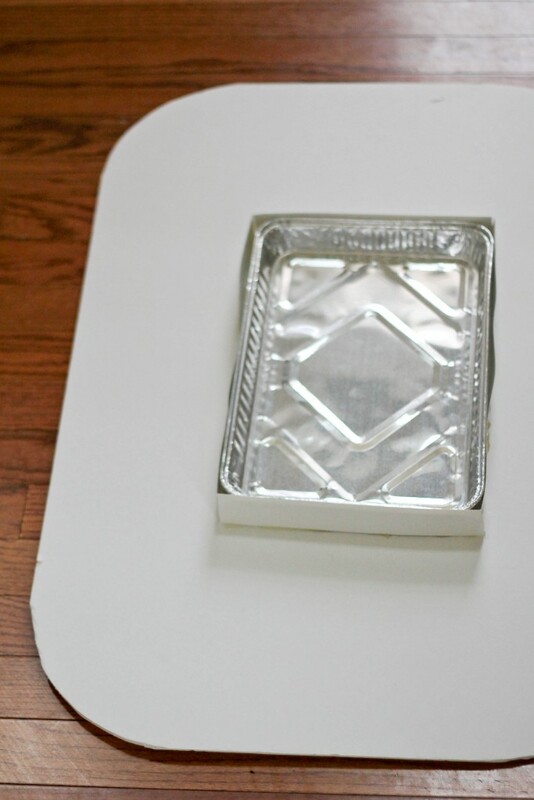 With the aluminum pan still in place, glue the strips of poster board around the pan to form a border. Next measure the distance from the edge of the border to the ends of the base and cut 6 strips that will be in the center and 4 longer strips that will form the larger sections. These pieces will form the sections that hold the food. I determined that I wanted the height of the border to be 4 1/2 inches high so I cut the strips on a diagonal; 4 inches on one end and the other end equal to the height of the foil pan in the center. Now glue the strips around the pan to form the sections. Add the longer strips to the corners. Next cut strips of poster board that are 4 1/2 inches wide and glue on the outside to form the border and you’re done! 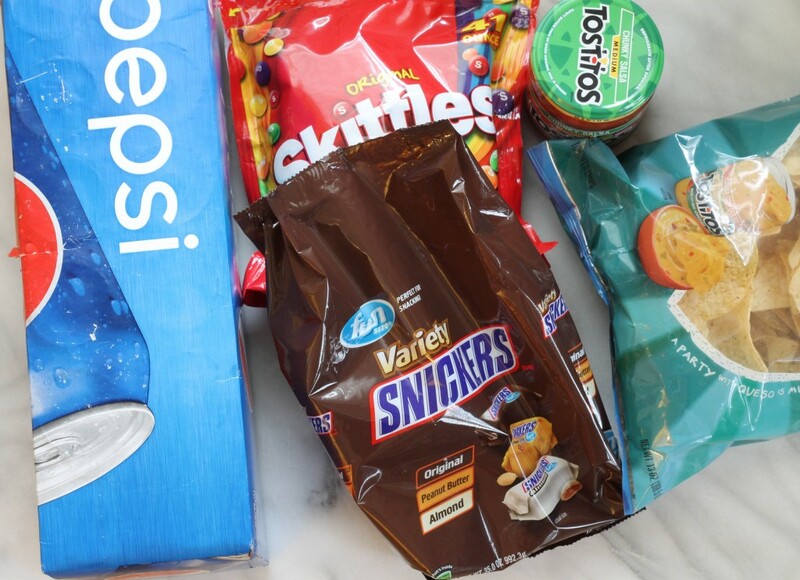 Decorate as you like and fill with your favorite snacks. I added a mini jumbotron, flags and fan signs. 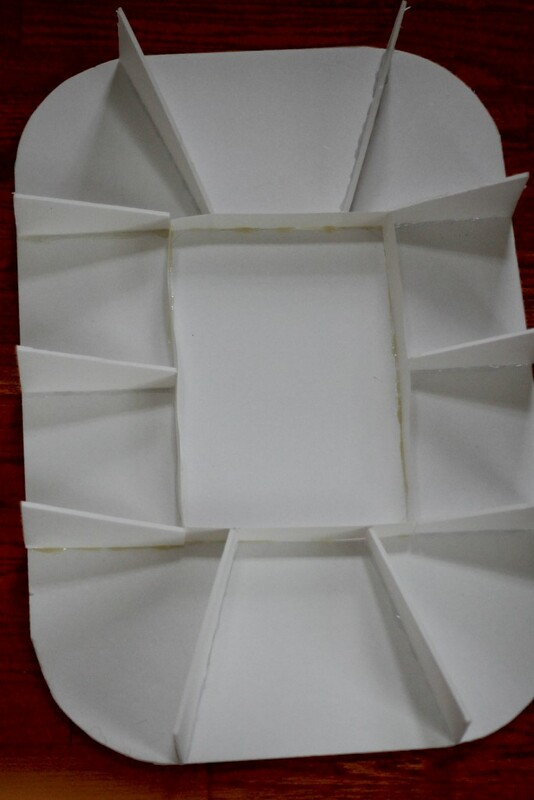 It is easier to use foam board than cardboard; it is easier to cut and work with. Glue the pieces on both sides so that the foam board pieces will have proper support. 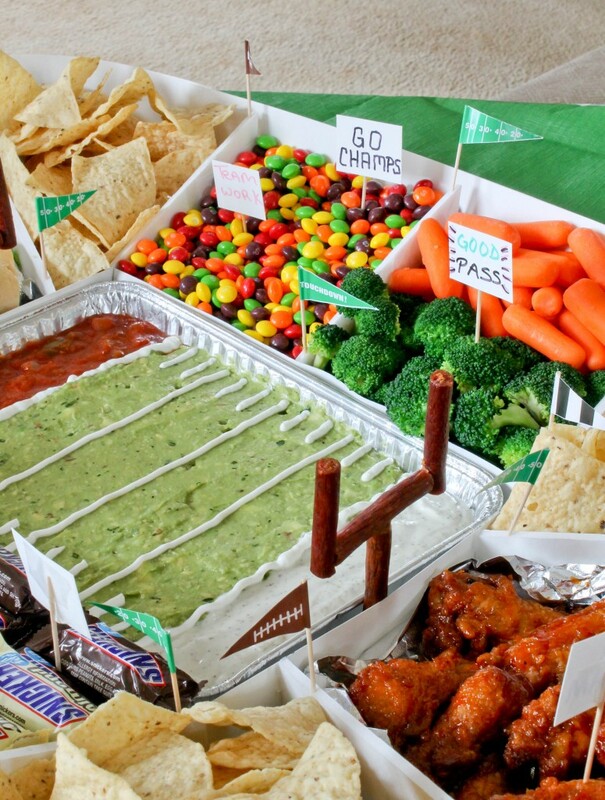 Use foil to line the snack stadium making it both sanitary and a breeze to clean. To make the field I simply used a combination of dips and piped thin lines of sour cream. 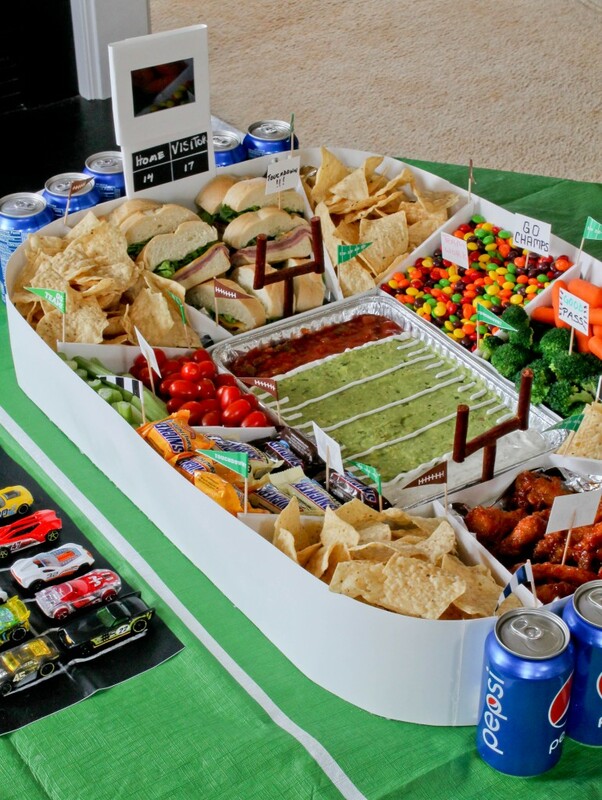 Have you ever built a Snack Stadium before? 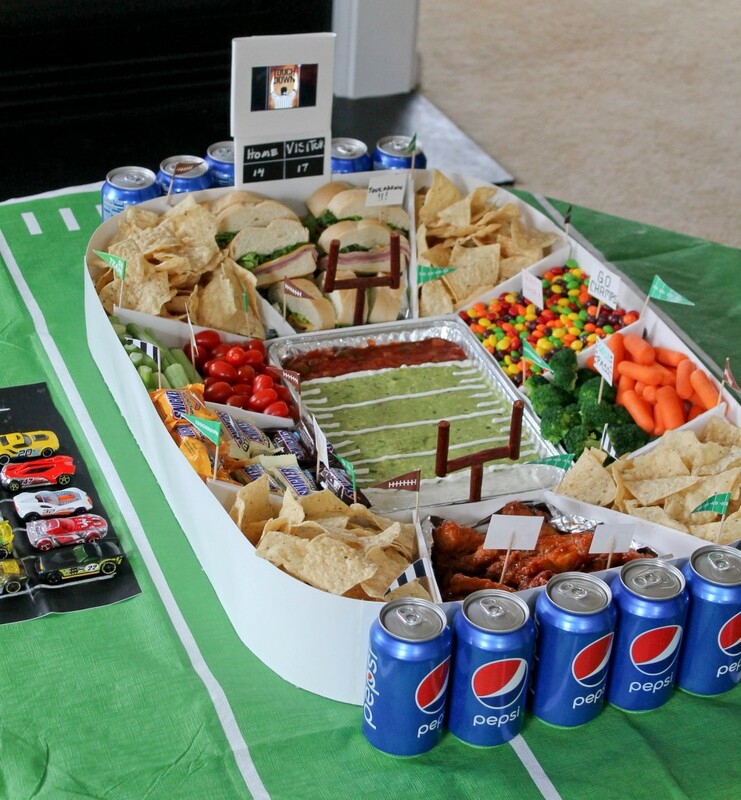 Click here for more snack ideas and snack stadium inspiration. I love to see the chicken! Looks delicious! Please post your recipe 😀 Thanks! Hi Shinel, the chicken was from Walmart’s deli. This is awesome!! 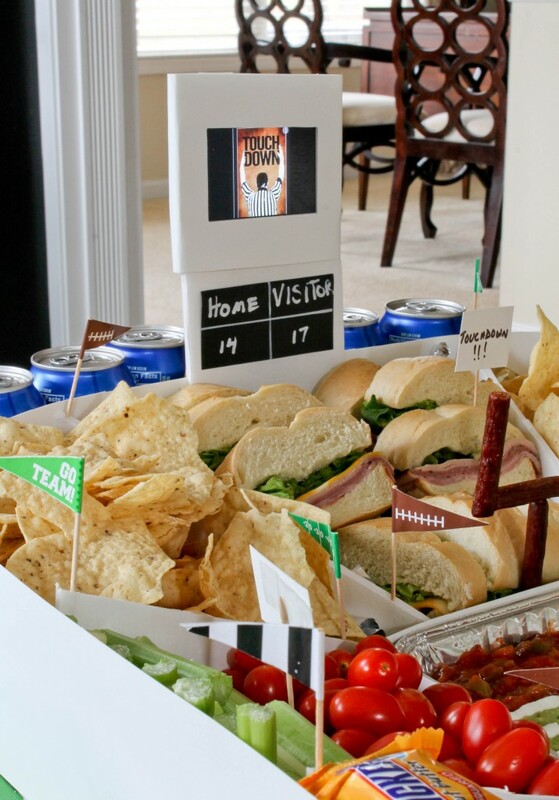 I want to have a football party just to create this!! So much fun!! Thanks! And it’s so easy to do!